Many nonprofit organizations define online success by its effectiveness in augmenting their offline fundraising. Certainly a level of praise is justified for such efforts, but to truly realize the full potential of the Internet we must go beyond mere integration of marketing. A new perspective is needed . . . we must move the Internet from after- to forethought in our minds. Imagine if the Internet was your only way to communicate with donors. Suddenly, you would need to transform financial transactions into altruistic experiences. In order to design the most compelling online experiences, you must understand the donor context. Good marketers know what works online, but great ones understand why things work. “Do Good” donors are people who are inspired to contribute to your organization once in response to an urgent need but their hearts are with another cause. The chances of these people developing a significant relationship with your organization is unlikely. These donors best respond to banner ads for “urgent” needs that are placed on your home page and/or associated with keywords on search engines. “Make a Difference” donors are highly motivated by results. They’re looking for experiences and are open to a world of possibilities. These donors want specifics on how their resources are being used effectively. Furthermore, they will become your organization’s strongest advocates, if you allow them to be, by giving them a megabyte or two. Create a space on your Web site for a “social network” that’s centered around your cause to grow. “Shared Mission” donors are people who value the same things you do. They are proud to declare their association with you. The more clearly you define what you believe, the better you will be at finding these vital constituents. These people select their charities the same way they do political candidates and parties — aligning with those with whom they share similar beliefs. Where on your Web site do you present what you believe? “Shared Vision” donors are people who are your most loyal constituents. These people believe in your Big Idea and want to help accomplish it. Present your vision and ask people to join you, then relate to them in that manner in all subsequent communications. Certainly, there could be more than four donor classifications, but these are the building blocks — the DNA, if you will — for which to create content in order to engage and inspire people. Contextual Fundraising™ is a new concept I created, but it’s based on decades of understanding why donors give to charity. Donors are looking for a vision . . . a vision so crystal clear and inviting that it allows them to do more and be more. The model on below is called Online Giving DNA. Its purpose is to help nonprofits understand the context of donors, i.e., why they do what they do. Understanding why donors give will help you shape and present inspiring content that answers donors’ unspoken questions. One of your primary Web site objectives should be to build a strong case of support for your organization. 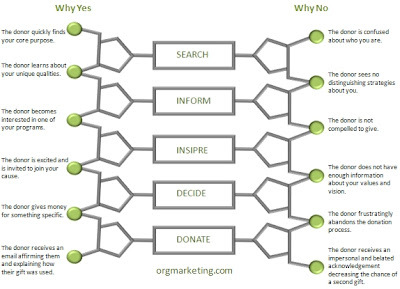 To do so effectively, you must map out, for each donor classification, a path of persuasion; an encompassing experience that channels donors’ passion through your Web site, inspiring them to join your cause. 1. Who do I want to come to my organization’s Web site? 3. How do I motivate them to do it? 4. How am I going to measure my effectiveness? The most effective home pages are like a rhinoceros . . . they make a single point, powerfully. To create a home page that has this effect, ask yourself what is the point of your organization? Why do you exist and why are you worth a person’s time, talent, influence, resources and/or money? You only have seconds to make your point — i.e., to present your core purpose — so don’t major on the minor. Forget your nonprofit’s 30-second elevator speech. On the Internet, 30 seconds is an eternity. Get to the point fast and focus on achieving your primary objectives, and watch your income soar.